Image via WikipediaWe are turning pink for the rest of October to support Jen and Isabel, and Suzanne and almost 200,000 other women. Nearly 200,000 women will be diagnosed with breast cancer this year. 1 in 8 women will be diagnosed with breast cancer during their lifetime. When breast cancer is detected early (localized stage), the 5-year survival rate is 98%. Breast Cancer Awareness Month Oct. 14, 2010. Wow, this is amazing! Awareness is so crucial. Thank you so much! Jen - Our thoughts and prayers are with you. Take care and stay strong. Diplopundit, this was AWESOME! Love the picture of the White House, and love the pretty blog background. Just beautiful, all of it! 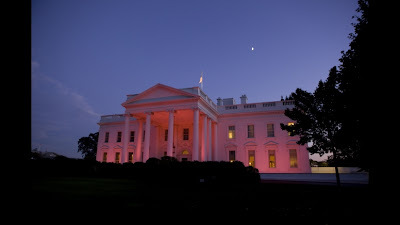 The White House looks almost tropical in pink! Awesome post on awareness. @Becky - Thanks for doing the blog roundup this week!